WHEN Bernard Traynor’s doctor said he should leave the UK for the good of his health, he and his wife Carole headed to the Dordogne. Living close to Rochdale, north of Manchester, Bernard and Carole took up the offer of staying in a friend’s house near Bergerac whilst they looked for a home. They fell in love with a railway cottage, restored it and now live there with their cats and dogs and the 11.30 to Perigueux. “When the doctor said that Bernard needed to leave the UK and find a drier place to live we didn’t know where to go,” said Carole. “At first we stayed at a friend’s house near the Dorogne river, that was in the middle of being redecorated, and began looking across the region for our own place. Like many railway cottages at signal crossings automation of the barriers meant that the French national railway SNCF sold off the buildings. 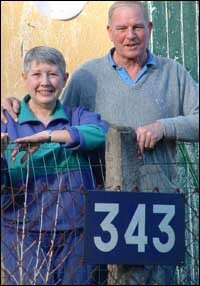 And even though the cottages were built to last, the one Carole and Bernard bought still needed a lot of work. “The place was just a shell really with no doors or windows, no kitchen, no bathroom the only real positive was that the roof was in good order,” Bernard explained. “But with the help of friends and plenty of hard work we now have a bedroom and bathroom upstairs and a lounge and kitchen on the ground floor. The couple have had hard times but seen a side of the French they admire greatly, the sense of community. Carole was involved in a car accident, had to be cut from the vehicle and spent a week in hospital. Everyone helped out. “Friends drove Bernard to the hospital to see me every day and others went and bought the shopping or saw to my cats and dogs,” Carole said. “When the doctors explained things to me a friend was beside me to help with the translation. Bernard and Carole are convinced that the decision to move to their railway cottage, number 343, was the right move and look forward to every day. “In the morning you look out the window and you can see a deer in the field or an eagle sweep down the railway cutting, it’s beautiful,” said Carole. Lovely to read Carole and Bernard story but where on earth did they find 23 railway houses to look at. We have similar ideas of renovating an old railway house but the one and only one we found was sold by the time we got there. Anyone know of such gems for sale? In the dordogne, vienne area. Please let me know. This story was written nearly four years ago now and Carole and Bernard were looking for railway cottages in France a few years before this as well. Nowadays there are very few cottages available either original or revamped, the rail authorities quickly realised the value of the properties and very few come on the market nowadays. I think you'd have to spend some time in an area, maybe renting at first, to try and track down any that come on the market, but it would be a tough ask.